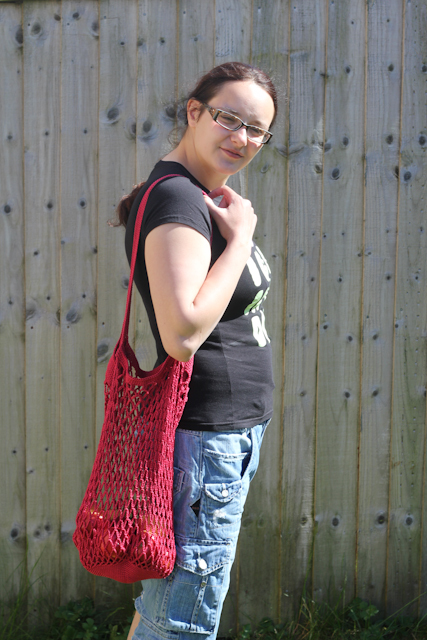 bunny mama's corner: A big summer tote I designed for a wool shop. June was a really busy month for me. I've done so much stuff that had no time to write any posts about it. But it is just wrong to neglect my own blog for the whole month! So now I'm back with some pictures and stories about my June. 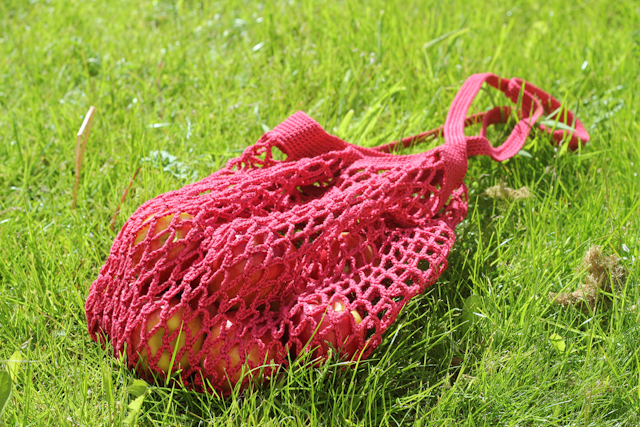 And here is me with the tote full of apples in one of the bright sunny days after I finished it. Well, the face expression could have been better, but the sun was shining right into my eyes. I've used 100% mercherised cotton, a total of 150g, and a crochet hook Nr.3 (yes, my favourite one:)) and the pattern is now available at "Knitters World Scarborough". They are working on their web page so hopefully it will soon be available on-line too. Even in a small town you found something interesting to do!